Most people tend to view Christian literature as well…boring, dry and functions best as a sleep-inducing tool. Reading has always a favourite hobby of mine, as far back as I can remember, and I enjoy books of various genres. The one thing that I had always wondered is why there is an absence of books written for a widely secular audience but yet loaded with Christian values and presented in a manner that paints Christianity in a positive and appealing light. It would be a perfect way of sharing Christ and His values in a most non-threatening manner. Over the years, I had concluded that it is probably a case of sensibility – dollars and cents just do not marry seemingly lofty heavenly morals. It would be hard to create a riveting storyline with God lurking between the lines, most people would have turned away. Thus, most Christian authors of secular fiction books will just mention God in their foreword or acknowledgment page. Imagine my delight when I found Karen Kingsbury’s series of books. If you have not read any of her books, you would have missed out on powerful stories beautifully crafted to illustrate God’s blessings and ways in the lives of ordinary families and people. It is totally refreshing to see how ordinary people struggle with and live out kingdom values. Her stories touch on themes of love, loss, death, forgiveness, fame, acceptance, loyalty, trust, etc. 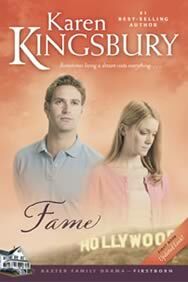 Kingsbury effectively portrays Christianity not as a religion but for what it is – real relationship with God. God comes through so strongly through her books that as I followed the story, I found myself tearing at times and stopping now and then to pray for myself or my family. You know it is a good Christian book when you feel motivated to do something for God. But you know it is a fantastic Christian book when you are compelled to immediately stop reading to respond to the message God is bringing you through the book. And only after you have responded then you are able to pick the book up to continue reading. God bless Kingsbury for being a literary agent of God’s message to the world. She is also involved in various ministries ministering to different groups! Verdict : 10/10. I love all her books!